Depending upon the charge, there are anionic or cationic polyelectrolytes. Polyelectrolyte are both flocculants as well as de­flocculants depending upon the molecular weight. A flocculant is essentially a solid liquid separating agent while a de­flocculant is a dispersing agent. Polyelectrolyte flocculants have a certain amount of polar groups on the molecular chain, it can through the adsorption of solid particles suspended in water, bridging between particles or through the charge and make the particle formation of large flocs condensation. So, it can accelerate the settlement of particles in suspension, have obvious to speed up the solution to clarify, promote filtering and other effects. As the flocculant, it is mainly used for various industrial effluent flocculation sedimentation, and clarification treatment, such as iron and steel plant effluent, paper effluent, food plant effluent, textile effluent, electroplating wastewater, wastewater metallurgy, coal washing wastewater treatment, sludge dewatering, as well as mining water treatment. Can also be used to clarify and drinking water purification treatment, drilling mud additives and sugar & juice mills. Soluble in water, safe, non-toxic, hydrolytic stability, is not sensitive to the change of pH value, anti-chlorine. No-flammable and non-explosive, it can be stored at room temperature, it cannot be placed in the sun. It is slightly acidic, when skin contact, wash immediately with plenty of water. 1 Raw water treatment Polyelectrolyte flocculant can be used for sedimentation, thickening and suspending removal for the raw water, such as industry water, river water, rain water etc. 2 Sewage Water Treatment The nonionic type polyelectrolyte works well in acidophilic water systems. If matched with PAC or aluminum sulphate, the effect will be excellent. 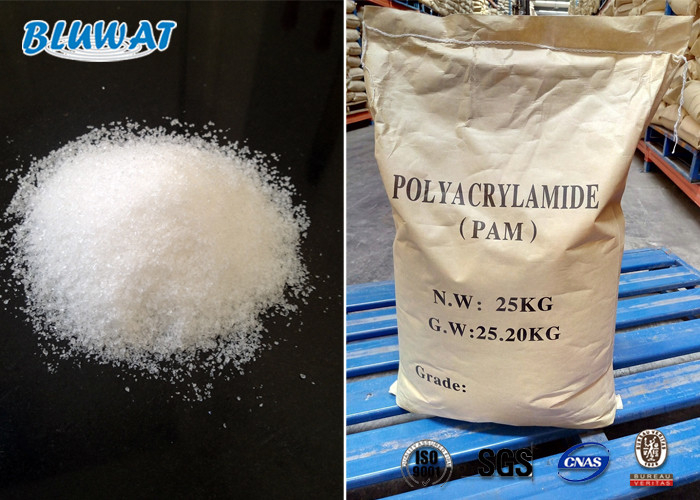 3 Industrial Wastewater Treatment Most of the industrial wastewater can be dosing polyacrylamide to removal suspended solids, and can reduce the consumption of coagulant and speed up sedimentation. 5 Chemical mudding agent As chemical mudding agent for plugging water of dikes, ground foundation, channels and the like. 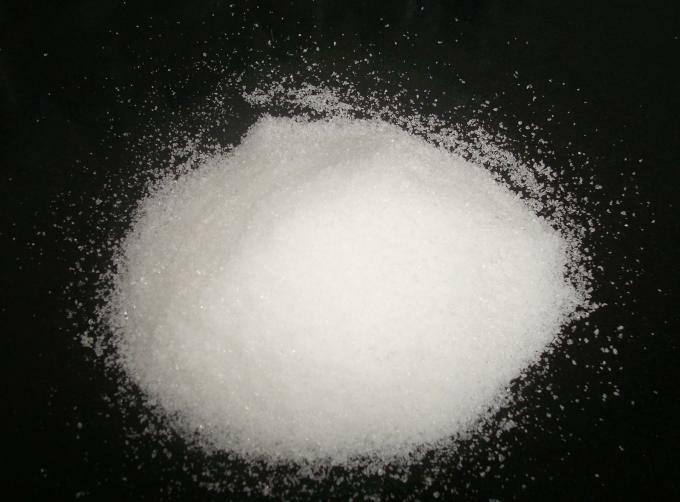 6 Paper-making Anionic polyelectrolyte is used as fixing agent, and cationic as residency agent, filtration aid and paper dry and wet intensity reinforcing agent in paper-making industry. 7 Sand Prevention Solidification Dissolved into 0.3% concentration and cross-linking agent added. It can be sprayed on desert to prevent and solidify sand. 8 Oil field Oil field profile controlling and water- plugging agent, matched with lignocellulose and a certain amount of chemical adhesive added. It can be used as oil field profile controlling and water-plugging agent. In oil field, as a kind of mud additives. To increase the viscosity of water and improve the effectiveness of the water flooding process. 11 Soil humectants Anionic type polyelectrolyte can preserve water and solidify sand for soil and can play a role of humectant on slope grass planting, tree planting, and sand solidification and dust prevention of soil. 12 Textile industry The anionic and nonionic type polyelectrolyte can be used in textile Sizing, as a kind of composition for chemical grout, starch textiles, highly improve the adhesive property, penetrability and desizing performance, enable the textile to have electrostatic prevention performance, reduces the desizing rate, and reduces the starch mixing spots, cloth machine breaking efficiency, and falling objects. In floatation and smelting of Zinc, manganese and copper mines, its leachate and slag can be added into polyelectrolyte to improve the separation efficiency. 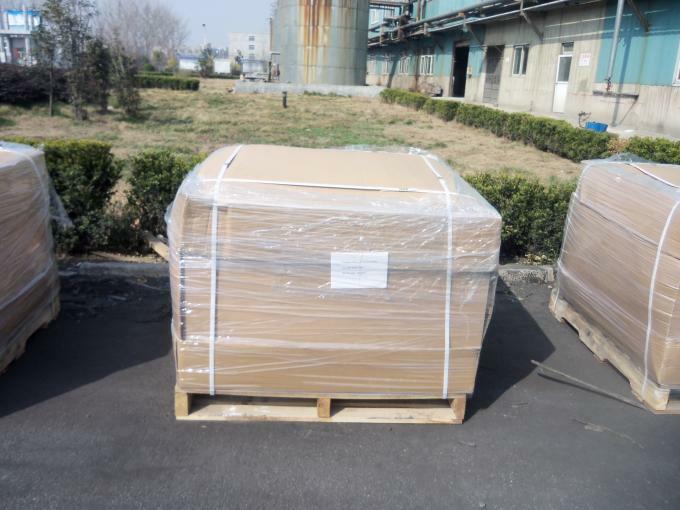 Packed in 25kgs net Kraft or PE bags with inner plastic bags palletized, or 750kgs net big bag.